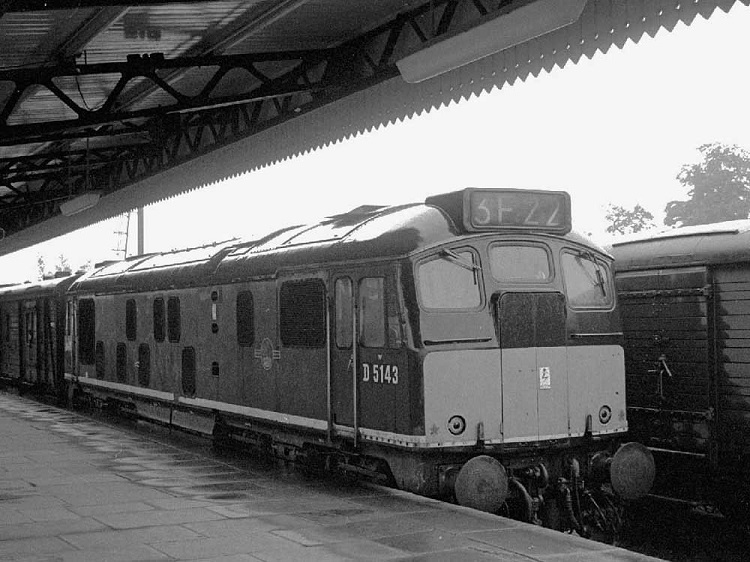 Photograph courtesy Tony Sayer A heavy downpour at Leamington adds a little shine to the paintwork of D5143 on August 30th 1966. D5143 is only a couple of months out of an overhaul at Derby. The fifteen year two month career of D5143/24143 was spent allocated only to London Midland Region depots. Time between last Classified repair and withdrawal: ?? July 1965 to Crewe North (5A). October 1965 to Willesden (1A). December 1965 to Crewe North (5A). April 1966 to Stoke Division (D05). August 1966 to London Division (D01). January 4th 1976 to serviceable store. After withdrawal 24143 was stored at Crewe from January 1973 to February 12th 1976 when it was forwarded to Swindon Works and broken up by the first week of May 1976. Movement: 24053/75, 24143/145 06.45 9X22 Crewe – Swindon February 12th 1976. Noted Derby Works May, October & November 1961. Noted Doncaster Works May 1964. Noted Derby Works March - May 1965. Noted Derby Works March & April 1966. The second to last block of Class 24s were laid down at Derby Works during the autumn of 1960. When outshopped D5143 - D5146 were allocated to Willesden (1A), the only brand new Class 24s to be delivered to Willesden, most others came on transfer from Eastern Region depots. D5143 was a frequent visitor to Derby Works during the early part of its career, it was noted there during May, September & October. Condition August: green livery with yellow warning panels, curved upper corners, possibly the panel does not cover the frame level stripe, shortened fuel & water tanks, ridge sided sandboxes, three-rung bogie mounted footsteps, engine exhaust located above engine room. November saw Derby Works receive D5143 for attention. Works visits included D5143 to Doncaster in May. D5143 made three moves during the year, to Crewe (5A) in July, south to Willesden (1A) in October and then back to Crewe (5A) in November. Visitors to Derby Works during the year included D5143 from March to May. D5143 returned to Willesden (D01) during August, the following month it was reallocated to the Stoke Division (D05). Visits to Derby Works included D5143 in March & April. On July 19th an excursion from Bristol to Aberyswyth utilised 5145 & 5143 west of Shrewsbury. 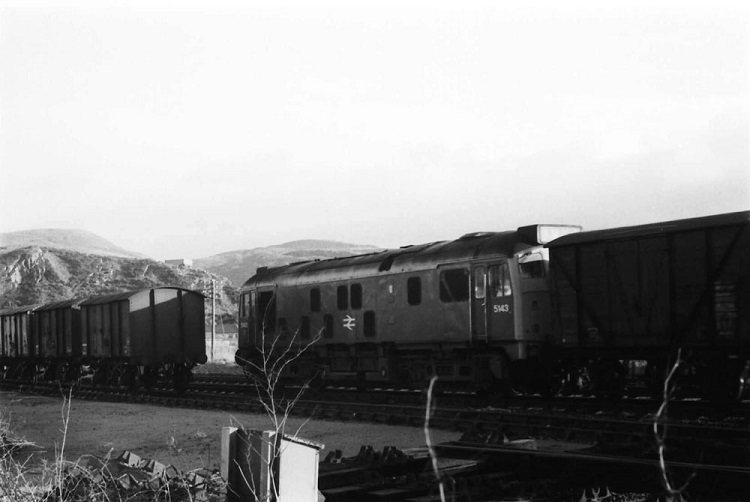 Photograph courtesy Barrie Watkins An undated view, possibly about 1973 finds 5143 shunting the yard at Penrhyndeudraeth, including to the left some gunpowder wagons. August 6th found a Banbury/Leamington – Barmouth special in the hands of 24085 & 24143 working throughout. 24143's No.1 cab sported quite a dent on the secondman's side of the cabfront. 24143 was withdrawn on January 31st 1976. Condition final: blue/yellow livery, gangway doors not removed, shortened fuel & water tanks - both fitted with circular gauges, straight sided sandboxes, three-rung bogie mounted footsteps, hand/footholds plated over. No.1 ebd cab front, 2nd man's side corner: good sized dent midway between handrail and bottom of cab. Page added September 8th 2016. Last updated July 20th 2018.